This lovely 2,762 sq. ft SOLAR home is situated on a spacious 11,000 sq. ft. pie-shaped lot at the far end of one of the most secluded cul-de-sacs in Trilogy. Quiet and peaceful when you want, but close to all the amenities that the Trilogy lifestyle has to offer. 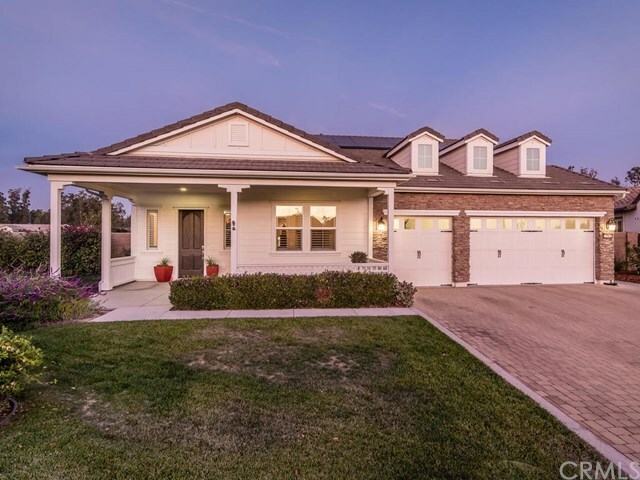 The exterior features a highly sought-after 3-car garage and a delightful front porch for enjoying your morning coffee or glass of wine in the evening. Inside, this 2 bedroom plus a den, 2 Â½ bath Morro home is an entertainerâs dream. The open-concept kitchen and adjacent living and dining areas are exceptionally spacious and feature a double-sided fireplace as a warm and cozy focal point. Over $100,000 in upgrades throughout, including large tile floors, granite countertops, plantation shutters and a built-in media center. The gourmet kitchen is inviting with its stainless steel appliances, rich wood cabinets, and a large radius island with soft pendant lighting. The tucked-away master suite is a true oasis with its spa-like bath and large walk-in closet. The master bath features a separate garden tub in addition to a spacious tiled shower. As if that werenât enough, this beautifully landscaped home features plenty of patio area for all your entertaining needs. The enclosed backyard is ideal for pet owners and is accessed from two sets of French doors off the main living area. Best of all, this home is located in Trilogy at Monarch Dunes, where the resort-style amenities will make you feel youâre always on vacation.